1702 ~ 1716: born in Kamigata. He starts his career at an early age, playing under the name of Matsumoto Kaheiji in children-actors troupes. He takes the name of Anegawa Shinkurô at an unknown date. 2nd lunar month of 1716: Anegawa Shinkurô takes the name of Nakayama Shinjûrô, playing in the kaomise drama "Chôja Mannengura", which is produced in Ôsaka by Sugiyama Heihachi and Nakamura Gentarô. 11th lunar month of 1723: Nakayama Shinjûrô takes the name of Nakayama Shinkurô I in Ôsaka at the Naka no Shibai, playing the role of Watanabe Kingo Katsuharu in the kaomise drama "Chûshin Futaba no Matsu", which is produced by Matsushima Hyôtarô. 1st lunar month of 1724: Shinkurô achieves a great success in the same theater by playing the role of Akamatsu Sokuyû in the drama "Ôtô-no-Miya Asahi no Yoroi". 11th lunar month of 1728: Shinkurô achieves a great success at the Kado no Shibai by playing the role of Hideyama Sanzaemon in the kaomise drama "Aioi Chôja Sangai-gura", which is produced by Arashi Sanjûrô II. 1st lunar month of 1731: Shinkurô plays the role of Yamamoto Kansuke in the drama "Takechi Jûbê Miyako Nishiki", which is produced in Ôsaka at the Naka no Shibai by Iwai Hanshirô III. 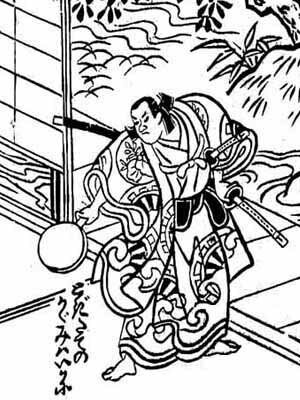 11th lunar month of 1734: Shinkurô becomes zamoto at the Kado no Shibai, working for the nadai Shioya Kuroemon; he produces the kaomise drama "Shin Yakata In'yô no Ishizue" with the following line-up: Sawamura Otoemon I, Izumikawa Sennosuke, Tamiya Shirogorô, Yamashita Matatarô I, Kamakura Heikurô I, Asao Motogorô I, Kirinami Takie and Matsushima Moheiji. 11th lunar month of 1736: Shinkurô becomes zamoto at the Naka no Shibai, working for the same nadai; he writes and produces the kaomise drama "Furômon Kon no Shikigawara" with the following line-up: Arashi San'emon III, Arashi Sanjûrô II, Sanogawa Hanazuma I, Yamashita Matatarô I, Nakamura Jûzô I and Fujikawa Heikurô. 11th lunar month of 1737: Shinkurô produces at the Naka no Shibai the kaomise drama "Fukakusa-no-In Sannô no Maki". 8th lunar month of 1738: Shinkurô produces in the same theater the drama "Shinoda Zuma"; the roles of Ashiya Dôman, Abe no Yasuna and Kuzu-no-Ha are played by Fujikawa Hanzaburô II, Arashi San'emon III and Matsushima Hyôtarô. 11th lunar month of 1738: Shinkurô plays the role of Ono Tanzaemon in the kaomise drama "Fuji Daiko Wagô no Shirabe", which is produced by Arashi Sangorô I at the Naka no Shibai. Fall 1739: Shinkurô settles in Kyôto. 11th lunar month of 1739: Nakayama Shinkurô I takes back the name of Nakayama Shinjûrô, playing the role of Tamura Gennojô in the kaomise drama "Oiwai Nô Nishiki no Manmaku", which is produced in Kyôto by Nakamura Kumetarô I. The program includes the shosagoto "Dôjôji", in which Shinjûrô achieves a great success by playing the leading role. 11th lunar month of 1740: he goes back to Ôsaka, takes back the name of Nakayama Shinkurô I and achieves a great success by playing in the kaomise drama "Hanaikusa Nishiki no Manmaku" and the dance "Dôjôji", which are produced by Nakamura Jûzô I at the Kado no Shibai. 11th lunar month of 1741: Shinkurô goes to Edo and plays at the Nakamuraza in Hayakawa Denshirô's drama "En'ya Hangan Kokyô no Nishiki"; his stage partners are Matsumoto Kôshirô II, Nakamura Tomijûrô I, Sanogawa Mangiku, Tomizawa Tatsujûrô and Sawamura Sôjûrô I. Shinkurô plays the leading role of the shosagoto "Dôjôji". 1st lunar month of 1742: Shinkurô's rank in the Edo hyôbanki, tachiyaku section, is jô-jô-kichi (superior - superior - excellent). Fall 1742: Shinkurô goes back to Ôsaka. 11th lunar month of 1742: Shinkurô plays the role of Todoroki Kôsuke in the kaomise drama "Kudô Suketsune Ôiso Gayoi", which is produced by Nakamura Jûzô I at the Ônishi no Shibai. 7th lunar month of 1744: Shinkurô plays the role of the sumô wrestler Nuregami Chôgorô in Matsuya Raisuke I's drama "Otokodate Gojitsu Kagami", which is produced at the Naka no Shibai by his brother Anegawa Shinshirô I. Shinkurô wears ons stage the anegawa geta ("Anegawa wooden clogs) and the anegawa zukin ("Anegawa hood"), which started a new fashion in Ôsaka when Shinshirô used them in the 1st lunar month of 1743 in the drama "Kurofune Isse Ichidai Otoko". 1st lunar month of 1745: Shinkurô's rank in the Ôsaka hyôbanki, tachiyaku section, is jô-jô-kichi (superior - superior - excellent). 9th lunar month of 1745: Shinkurô plays the role of Yokanpei in the drama "Ashiya Dôman Ôuchi Kagami", which is produced by Nakamura Jûzô I at the Ônishi no Shibai; his stage partners are Bandô Toyosaburô I (Abe no Yasuna), Nakamura Jûzô I (Ashiya Dôman), Ichikawa Danzô III (Sakon Tarô), Arashi Shichigorô I (Yakanpei, Shôgen) and Yoshizawa Ayame II (Kuzu-no-Ha). 12th lunar month of 1745: the drama "Natsu Matsuri Naniwa Kagami" is performed for the first time in Ôsaka, simultaneously in the three major theaters of the city, which starts a competition for the best performance and line-up; Shinkurô plays the role of Danshichi Kurobê at the Ônishi no Shibai [casting]. 11th lunar month of 1747: Shinkurô goes to Kyôto, takes back the name of Nakayama Shinjûrô and plays in the kaomise drama "Meiken Kogane Zukuri", which is produced by Nakamura Kumetarô I. 11th lunar month of 1750: Shinjûrô plays in Matsuya Raisuke I's kaomise drama "Kaikei Wagô Hanayakata", which is produced in Kyôto by Miyako Handayû. 1st lunar month of 1751: first Kabuki adaptation of the puppet theater drama "Tamamo-no-Mae Asahi no Tamoto", which is produced in Kyôto by Miyako Handayû at his theater; Shinjûrô plays the roles of Kazusanosuke Tsunehiro and the farmer Jûsaku [casting]. 11th lunar month of 1751: Shinjûrô joins his adopted son Nakayama Bunshichi I, the zamoto working with the nadai Hayagumo Chôdayû in another theater in Kyôto. The two actors play together in the kaomise drama "En no Gyôja Ômine Zakura". Fall 1752: Shinkurô and Nakayama Bunshichi I go together to Ôsaka. 11th lunar month of 1752: Nakayama Shinkurô I and Nakayama Bunshichi I take the respective names of Wakayama Shinkurô and Wakayama Bunshichi at the Ônishi no Shibai, performing in the kaomise program "Kyô Miyage Matsuri Zoroe", which is produced by Sanjô Sadasuke; their stage partners are Yamamoto Kyôshirô I, Ôtani Hirohachi I, Iwata Somematsu I, Matsushima Kiyosaki, Ichimura Sanohachi, Kirishima Gizaemon, Kiriyama Monji I, Matsushima Moheiji, Takenaka Heikichi, Murayama Heijûrô IV and Nakamura Shirogorô III. Fall 1755: Wakayama Shinkurô takes back the name of Nakayama Shinkurô I. 11th lunar month of 1756: Shinkurô plays at the Ônishi no Shibai in the kaomise drama "Ômatsu Kyokusuke Tanzen Roppô". 11th lunar month of 1758: Shinkurô plays the role of Tankai Sôshin in the drama "Arigatashi Fujiwara Keizu", which is produced by his adopted son Nakayama Bunshichi I at the Kado no Shibai. 5th lunar month of 1762: premiere in Ôsaka at the Kado no Shibai of Namiki Shôzô I's drama "Koi Hakke Hashira Goyomi", which is a revision of Chikamatsu Monzaemon's drama "Daikyôji Mukashi Goyomi"; Shinkurô plays the role of Gonbê [more details]. 7th lunar month of 1763: Shinkurô plays the roles of Kakuju and Fujiwara no Shihei in the drama "Sugawara Denju Tenarai Kagami", which is produced by his adopted son Nakayama Bunshichi I at the Kado no Shibai. His stage partners are Nakayama Bunshichi I (Matsuômaru, Terukuni), Arashi Hinasuke I (Haru), Anegawa Daikichi I (Tonami, Yae), Asao Tamejûrô I (Hyôe, Shundô Genba), Nakayama Raisuke I (Umeômaru), Bandô Toyosaburô I (Shiratayû), Fujikawa Hachizô I (Genzô, Sukune Tarô), Ichinokawa Hikoshirô II (Sakuramaru), Yoshizawa Sakinosuke II (Chiyo, Tatsuta) and Nakamura Kichiemon I (Kan Shôjô). 9th lunar month of 1764: première in Ôsaka at the Kado no Shibai of "Oriawase Tsuzure no Nishiki", based on the puppet drama "Katakiuchi Tsuzure no Nishiki", which is produced by Nakayama Bunshichi I and celebrates the 16th anniversary (17th memorial service) of the passing away of the star Anegawa Shinshirô I. A similar play is staged one day later under a different title, "Hare Kosode Tsuzure no Nishiki", at the Naka no Shibai [casting]. The competition for the best performance and the best line-up is open between the 2 theaters. The performance at the Kado no Shibai is more successful than the one at the Naka no Shibai; Shinkurô plays at the Kado no Shibai the role of Shundô Sukedayû [casting]. 2nd lunar month of 1765: Shinkurô plays the role of Takemura no Sadashin at the Kado no Shibai in the drama "Koi Nyobo Somewake Tazuna". 11th lunar month of 1765: Shinkurô plays the role of Wada Shimpochi in the drama "Hana Yagura Kikigaki Taiheiki", which is produced in Ôsaka by Anegawa Kikuhachi. 12th lunar month of 1766: Shinkurô plays the role of Gonshirô in the drama "Hirakana Seisuiki", which is produced by Arashi Hinasuke I at the Kado no Shibai; his stage partners are Fujikawa Hachizô I (Matsuemon, Higuchi no Jirô Kanemitsu), Arashi Hinasuke I (Umegae), Ichinokawa Hikoshirô II (Kajiwara Genta Kagesue), Nakayama Raisuke I (Shigetada), Arashi Koroku I (Enju), Yoshizawa Ayame III (Oyoshi, Tomoe Gozen) and Arashi Shichigorô II (Kajiwara Heiji Kagetaka). 11th lunar month of 1767: Shinkurô and Bunshichi go together to Kyôto and play in the kaomise drama "Shinchoku Fukki no Kanatoko", which is produced by Ichiyama Sukegorô; Shinkurô plays the role of Asai Kenmotsu. 11th lunar month of 1768: Shinkurô and Bunshichi go together Ôsaka and play in the kaomise drama "Kômei Daifukuchô", which is produced by the zamoto Mimasu Tanin I at the Naka no Shibai; Shinkurô plays the role of the deity Fukurokuju. Spring 1771: tour in Ise with Bunshichi, Yamamura Kôzô and Fujikawa Hachizô I; Shinkurô plays the roles of Yazaemon ("Sushiya") and Yokawa no Zenji Kakuhan in the drama "Yoshitsune Senbon Zakura". 9th lunar month of 1772: Shinkurô appears on stage for the last time (isse ichidai performance); he plays the role of Hanzaemon in the drama "Monogusa Tarô", which is produced by Ogawa Kichitarô I at the Kado no Shibai. Nakayama Shinkurô I was one of the best tachiyaku of the eighteenth century. He was renowned for his great voice and the perfection of his lines delivery. Jitsugotoshi roles were his forte and he was also an outstanding jitsuaku.